first Top Of The Pops appearance. Mark Radcliffe has had a quite an interesting life, born in Bolton he was introduced to music at an early age. His father Philip was a Northern based critic for Classical music in the national newspapers. His dad then went on to become public relations chief for Manchester University where Mark graduated in English and American studies. After a stint at Manchester`s Piccadilly Radio in the late 70`s Mark Radcliffe moved to Radio 1 where he produced the sessions for the John Peel Show. 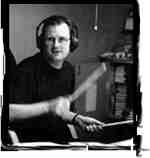 As legend tells it it was at one of these session that Mark Radcliffe and Lard first met. As producer of these sessions Mark had to listen to many hopeless bands that only John Peel seemed to like. Most of the bands were doomed to a life of failure and unemployment. On the 26th June 1984 a band came in that was so crap that Mark`s immediate reaction was "What a load of old tossers". But this was no ordinary band, this was `Marc Riley with the Creepers`, headed obviously by Levenshulme`s one and only wonder child Marc Riley, better known as Lard. This was not the boy Lard`s first Peel Session, in 1978 he did a session for John as the Bass player in Mark`e` (grumpy git) Smith`s band The Fall. However he was soon kicked out of The Fall for allegedly disco dancing on a tour of Australia and so was forced to form The Creepers. Lard also joined the comic called Oink! and set up In-Tape records which soon went bust. Mark Radcliffe did not take much notice of The Creepers dismissing them as crap until in 1990 he went on to present Radio 5`s `yoof` programme `Hit The North`. Lard had now become a record plugger for bands such as The Pixies, and the Cocteau Twins and spent many hours trying to get Radcliffe to play crap records. Radcliffe eventually took him on as his sidekick in the show and so the most important partnership since John Lennon and Paul McCartney was formed (although I imagine that some people may disagree with me on that one). is also a keen drummer. Hit The North was fairly similar to the show that we all know and love. It was only on once a week but Radcliffe`s unique blend of great music, humour, quality items and of course Lard quickly built up a cult following. Four of the sessions from Hit the North were released on the 'Seconds Out' Compilation. Radcliffe started on Radio 1 with the weekly show `Out On Blue Six` which mixed psychedelia with punk for which he won a Silver Sony award for "Radio Broardcaster Of The Year", amazingly the Gold award went to Radio 3`s Brian Kay. Mark also presented The Guest List which was an An Arts Program on Thursday nights from 9-10, Radio One. Mark presented it & I think Lard appeared in it, but it was so long ago. It went on for about two and half years. When Mark left Mark Kermode took it over. When Nicky Cambell vacated the 10-12pm. slot Mark & Lard jumped into it so from 28th October 1993 Radio 1 had a show which played great records, made us laugh and kept us informed about the latest goings on in the worlds of Art, Films & Music. This was The Graveyard Shift. Although Chris Evans is held up as the Man who saved Radio 1 he certainly owes a lot to Radcliffe. In the late 70`s when Radcliffe worked for Manchester`s Piccadilly Radio Chris was also working there as a junior. Despite being very enthusiastic the Ginger one managed to delete the tape containing an exclusive interview with Bob Geldof & he would have been sacked if Radcliffe hadn`t persuaded his boss to give Chris another chance. After all who wants to hear an interview with Bob Geldof. Ironically The White Room which Mark Radcliffe presented has now been dropped due to the success of Chris`s TFI Friday. In another twist of Mark and Chris`s relationship Mark became the person who filled in for Chris when he was away. 40 year old Mark is a keen Drummer and Lard likes playing guitar but he can also play the drums. As well as a love for music both of them share a love / hate relationship with Manchester City. They love the football team but hate the fact that they lose every game. Mark and Lard often claim to live in the little fishing hamlet known as Levenshulme. In fact Mark lives in a nice posh house in Great Budworth which is located in the countryside around Manchester. Other non-radio work for Mark has included presenting "4 Goes To Glastonbury" and `Mark Radcliffe`s NWA`. He had a weekly column in The Saturday Express called Outside Edge. Mark and Lard presented the NME Brat Awards on 28th January 1997. They may be quite busy but it is the Radio show where their greatness shows through. On February 17th 1997 they took another step up the showbiz ladder when they took over the Breakfast Show from the recently departed Chris Evans and have presented Top Of The Pops twice. Mark finally married his long term girlfriend Bella Sharpe on the 19th April 1997 in their home village of Great Budworth in Cheshire. Lard was the best man. and best man Marc Riley. On October 13th 1997 he and Lard moved to the 2-4pm Early Afternoon timeslot where they have now settled down. They released the Shirehorses debut album and played three dates with Blur. Soon after the Shirehorses split up Mark started a new band with Production Assistant Chris Lee called The Mahones which later changed it's name to The Family Mahone. The Shirehorses have since reformed and split under several names including The Mighty Horse and The Indecipherable Boys. Mark has written his first book Showbusiness about the time he has spent in his various rock and pop bands. His second daughter Mia Radcliffe was born in January 1999. Mark and Lard's Afternoon Show proved a success, winning it's second Gold Sony award for Best Daytime Radio Show in 1999. During this time they hosted two TV shows on digital TV channel UK Play, and became a regular musical touring fixture during freshers week. The Afternoon show continued to 2004 when Mark and Lard left Radio 1 to continue on separate paths. Mark moved to Radio 2 and Lard moved to digital radio. They are still good friends. We wish them all the best. Mark and Lard interview written by Neil Tipton. If you have any comments or suggestions then please email me .